A fourth cable has been cut, this time off the coast of the UAE, disrupting communications in Qatar. Qatar Telecom (Qtel) said on Sunday a cable was damaged between the Qatari island of Haloul and the UAE island of Das on Friday, the fourth reported in the Middle East in less than a week…. Parts of the Gulf Arab region were plunged into a virtual internet blackout on Wednesday when two undersea cables were cut near Alexandria, on Egyptâ€™s north coast…. The situation was made worse on Friday when Flag, part of India’s Reliance Communications, revealed a third cable, Falcon, had also been damaged off the UAE coast. In the meanwhile, conspiracy theories abound, since some reports say that along with Egypt, Saudi Arabia and India,Â Iran’s internet has been cut…and traffic is down to zero according to this site: LINK is the daily internet traffic report and indeed shows Iran at zero today…but it is also zero for Cali, Colombia and for Florida. The IHTribune has noted the internet problems, but doesn’t mention Iran. However, they do worry that the incidents show how underseas cables that concentrate internet and telephone lines are vulnerable to damage, whether it be an errant ship, an earthquake, or sabotage. It is not clear how badly Iran’s internet access has been affected by the cable breaks. The Iranian embassy in Abu Dhabi told ArabianBusiness.com that “everything is fine”, but internet connectivity reports on the web, citing a router in Tehran, appear to indicate that there is currently no connection to the outside world. No one at the US embassy in Abu Dhabi was immediately available to comment. So is the internet out, or slowed down, or being re routed from Iran? Hello?And the India BusinessStandard reports on various internet conspiracy theories, and quotes one blogger saying that Iran is back on line, but re routed via the UK so their traffic can be monitored. But again they only note local problems, not blackout (and note: The FLAG company whose cables were affected has Indian ties). A little truth would go a long way at stopping conspiracy theories. 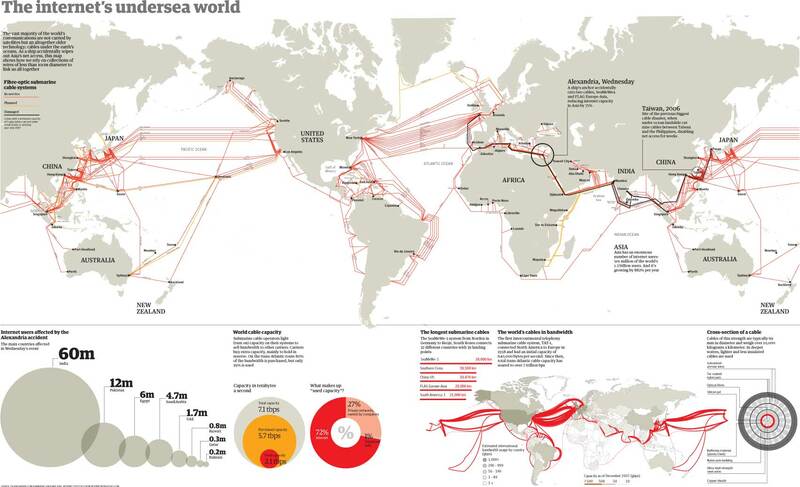 It seems highly coincidental that three undersea cables get cut and the only country entirely shut off is Iran. I doubt it is the first step before war, but you canâ€™t help raising an eyebrow when reality starts to intersect with fiction. Yet why don’t the news reports mention the Iranian internet blackout? Even Drudge isn’t reporting it…maybe because it isn’t true? The Egyptian cable essentially carries information for Egypt, Saudi Arabia and the Sudan, but it a major internet link carrying information west from the Middle East, Iran, and India. India also sends a lot of their information East via Pacific/Asian cables, but their internet is so widely used that there is a disruption from excess traffic on the eastern cables, and there has been a lot of scrambling to reroute internet usage. But the latest cuts off Qatar only affect branches of the main cable that link the smaller Gulf states with the main internet cables. Of course, cable damage isn’t unknown–the Wireless story also reports a cut or damage off the southern Coast of France about the same time as the Egyptian cable was cut. Like most local cable outages, this is a branch, not the main cable, so isn’t getting publicity. So is Iran on line or off line? Well, for what it’s worth, someone from Iran visited my blog yesterday so obviously reports of the “100% blackout” of the Iranian internet is not true. Nancy Reyes is a retired physician living in the rural Philippines. Her website is Finest Kind Clinic and Fishmarket, and she crossposted this at Podkayne’s blog. 5 users commented in " Conspiracy theories about Iran abound as 4th internet cable is cut "
Obviously the cuts are intentional. It’s highly irrational to maintain that all these seperate cables are getting cut within such a short period of time by causally unconnected accidents. The odds of that happening would be astronomically unlikely (indeed, such odds can even be calculated if one has access to data on previous accidental oceanic cable cuts). It would be akin to thowing a shuffled deck of cards up in the air and expecting them to land in an ordered deck. Nor is it even coherent to use the term “conspiracy theorists” in your above manner, i.e., as an ad hominem attack, since you too are a conspiracy theorist. A conspiracy is simply when two or more people take part in a plan which involves doing something unrightful or untoward to another person or other people (of which plan may or may not be kept secret, i.e., secrecy is not a necessary component for actions to be a conspiracy). For example, since obviously more than one person was involved in planning the 9/11 attacks, then by definition it is a conspiracy, even if one completely accepts the U.S. government’s story regarding it. Indeed, this makes government itself the largest corporeal conspiracy to ever exist (given that it exists via a double-standard of doing unto others what it does not want done unto it), or that could ever exist. Furthermore, conspiracies are ubiquitous (witness all the laws on the books against conspiracy, and how many people are routinely charged under said laws), and the most egregious perpetrators of murderously brutal conspiracies are governments upon their own innocent citizens. Not only were all of these government mass-slaughters conspiracies–massive conspiracies, at that–but they were conspiracies of which the 9/11 attacks are quite piddling by comparison. Once I saw an insanity virus waiting for a opportune moment to attack me from under a chair. As I inhaled, he rose toward my nostrils, stopped in mid-inhale, and whispered to me that his name was Thomas Redford. Not James. Are you any relation? Either way, there is no conspiracy. None at all. Now a fith cable has been cut, further confirming what I said in my post above. As I said therein, obviously the cuts are intentional. during the cold war the us sent a submarine and divers to place a listening device on soviet “secure” telecommunication lines (electric current communication) that ran along the coast. they periodically retrieved recorded data for the duration of the cold war. us admitted rf listening (ie: eschelon) has become increasingly impotent with communications taking place over the internet. that is the whole argument for bush’s domestic spying in “new era communication”. that is why the placed taps on major us backbone locations within at&t and others as klein revealed. the probability of multiple lines being accidentally cut should raise questions. the latest reports of egypt say their ships did not cut them as they have evidence they did not travel near the break. tapping into today’s optical fibers undetected needs them to be broken first – ie: the line needs to be taken down. time domain reflectometery can show a discontinuity if it occurs between repeaters, but an undersea tap at a repeater would later not be detected – unless one were willing to pull up and inspect all 1900 miles and verify the repeater was the original. the breaks occur curiously near egypt and other “states of interest” and us and israel have reason to be suspected. sure the us would like to track such things as how ubl’s tapes and communications make their way to aljazeera. ip logging would go far to better locate the source – some thing local inter-middle east country communication doesn’t avail the west to with their taps on domestic/international spying. given the factual history of the us behavior and the probabilities it suggests concern is prudent. some media coverage in the west intentionally/non-intentionally is denouncing the whole issue. some attempt to broadly paint all the possibilities as “conspiracy theories” simply because one offering that the us is taking out iranian communications prior to an attack, has shown that the communications were unaffected. they should be more concerned with what countries are served by these lines, how odd the coincident of multiple failures is, and of showing past history and relating it to current spying by the us administration. paying particular attention to a break in egypt’s line and the requirement of a “offloading” site in a nearby country to exploit the data. A fourth cable linking Qatar to the United Arab Emirates was then also damaged causing yet more disruption, telecommunication provider Qtel said. Earlier reports said that the damage had been caused by ships that had been diverted from their usual route because of bad weather. But Egypt has already excluded ships as the cause of damage to the Mediterranean cables thanks to footage recorded by onshore video cameras of the location of the cables which showed no traffic in the area when the damage occurred. Natural forces may still explain the cable breaks, but with a fifth cable break coming to light yesterday, people are increasingly questioning whether there’s more to the story. Also, FLAG Telecom announced it will lay a new, much stronger cable between Egypt and France. The new data link will be also laid on a different route. The new cable will be 1,900-mile-long and would allegedly take more than 18 months to complete, the company said. The cable system which was cut somewhere 5.2 miles from Alexandria beach in northern Egypt was co-owned by several companies, among which AT&T Inc., the biggest U.S. phone company, and Verizon Communications Inc., the second-biggest U.S. phone company. There is just one small problem: Iran’s internet connectivity was never lost. (notice how the above attempts to dispel by linking an old lost submarine with today’s events to discredit it. then proclaim iran’s internet wasn’t affected – true. and it is true non-invasive optical tapping is difficult (if not impractical) it is known (was known around ’85) possible in the laboratory. that is a diversion though, the better objective is to replace a repeater with one that can be tapped and then place that repeater over a electromagneticlly communicated base that siphons off the signal to a shore station). then again, what does one expect from “the economist” – self questioning of their own government? The Egyptian government has said that, contrary to earlier reports, the cable could not have been cut by a ship’s anchor since the breaks occurred in an area banned to shipping. The authorities insisted that no ships had passed into the forbidden zone in the 12 hours before and after the outage. Egyptian Minister of Transport Engineering Mohamed Mansour confirmed that there were no passing ships at that time. Meanwhile, some bloggers are suggesting that the breaks in the line were caused deliberately in an attempt to interfere with Iran’s internet access in preparation for more direct action by the US. Often the location of a break can be found by cable engineers back on shore. The areas affected by the outage will give key clues as to what part of the cable is broken. To get a more precise location, cable engineers can send light pulses along the fibres in the cable using a device known as a Optical Time Domain Reflectometer. There was disruption to 70% of the nationwide network in Egypt, and India suffered up to 60% disruption. Disruption also occurred in the United Arab Emirates (UAE), Kuwait and Saudi Arabia, reported the Associated Press. In Dubai, at least two internet service providers (ISPs) were affected. On January 30, two cables of the FLAG Telecom and SEA-ME-WE-4 were cut in the Mediterranean, causing internet disruptions in many countries in the Middle East. The Flag Europe-Asia cable was cut at 8.3 kilometres away from Alexandria, on Egypt’s segment with Italy, and located beside the other severed SEA-ME-WE-4. Two days later, the Falcon cable, also owned by Flag Telecom, was damaged 56 kilometres from Dubai, causing additional internet outages. Falcon and Flag Europe-Asia cables are being repaired, while the SEA-ME-WE-4 will remain severed for the time being. The cables of Flag and SEA-ME-WE-4 are long submarine cables that link South-East Asia to Europe through India and the Middle East. It seems highly coincidental that three undersea cables get cut and the only country entirely shut off is Iran. I doubt it is the first step before war, but you can’t help raising an eyebrow when reality starts to intersect with fiction. Hey I am an IT help desk guy, I read the post, its really nice post. Thank you for sharing the information with all, I have take your link and share with my friends…..